Commonly misunderstood is parts compatibility and lack thereof between are the T420 and T430 models. 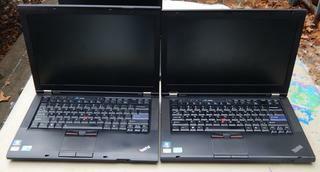 Unlike their X220 and X230 counterparts which can share everything, the 14" T-series feature a number of subtle differences in case and motherboard design. Only some internal parts are the same. The outer LED indicator lights are more or less in the same place. The Bluetooth light was deleted for the T430, however. Badges are larger on the T430. The Optical drive, Expresscard 34, and SDXC media reader are in the same place, but every other port and switch is moved all over the place. Barely any difference from the front, though. Opening the lid brings the most radical change, and some subtle ones. 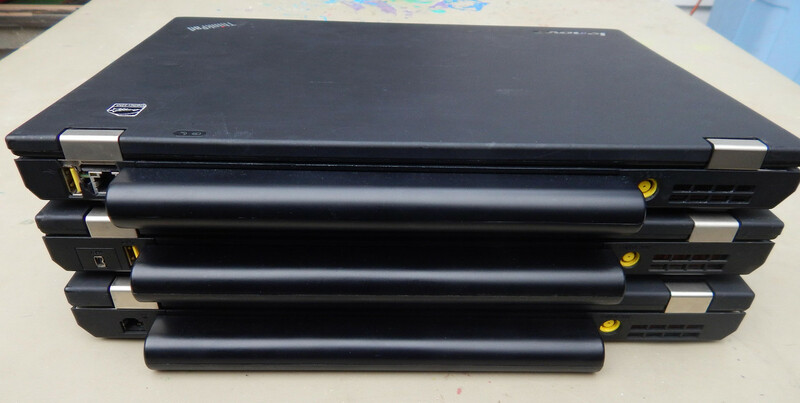 T430's hinges are lower, wider, and the lid is closer to the body. The screen is centered better in the lid. 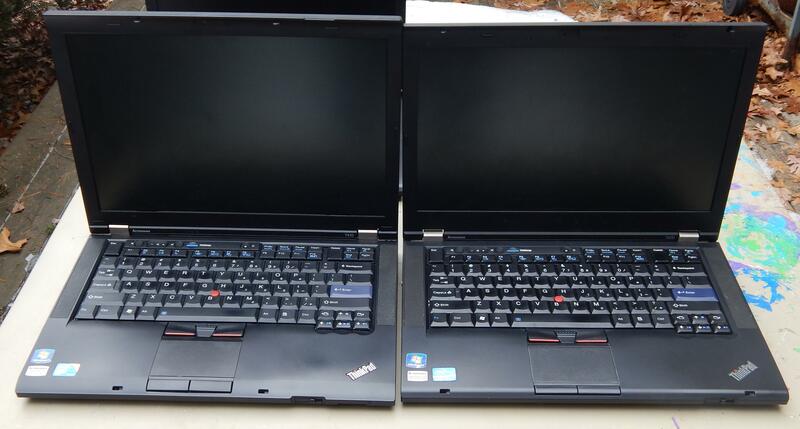 The T420's bezel size is ridiculous, the T430's is less so. Both have very bright LED lit screens that are good on power savings. edit 29 Apr 2018 They use the exact same LCDs and the cables, while different, are equivalent and intercompatible. T430's palmrest badge is bigger. 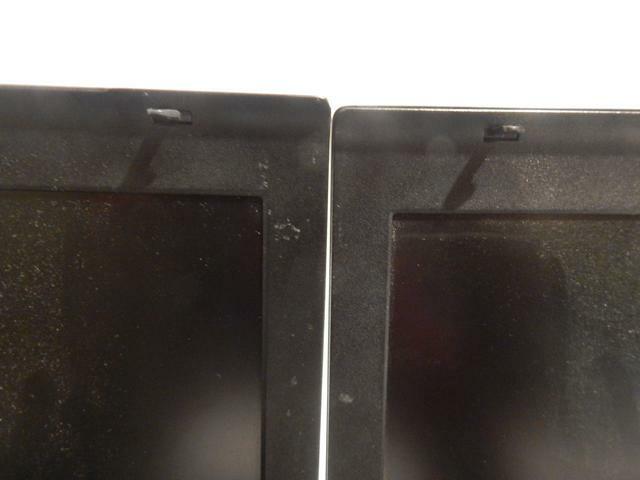 The touchpad buttons are the same. Story time: Before I rebuilt the T430, I had spilled water on the T420's touchpad and wrecked the buttons, so I stole the T430's buttons to replace the T420's. Now when I rebuilt the T430, I took the long-dried T420's buttons to put in the T430. The T430 comes across as a much prettier laptop than the T420 due to the full length beveling treatment of its lower edges, while the T420 still has boxes jutting out of it from its T410 heritage. That and the gigantic screen bezel make the T420 a very ugly laptop to me. Amazing how much subtle design changes can change the aesthetic of a laptop. 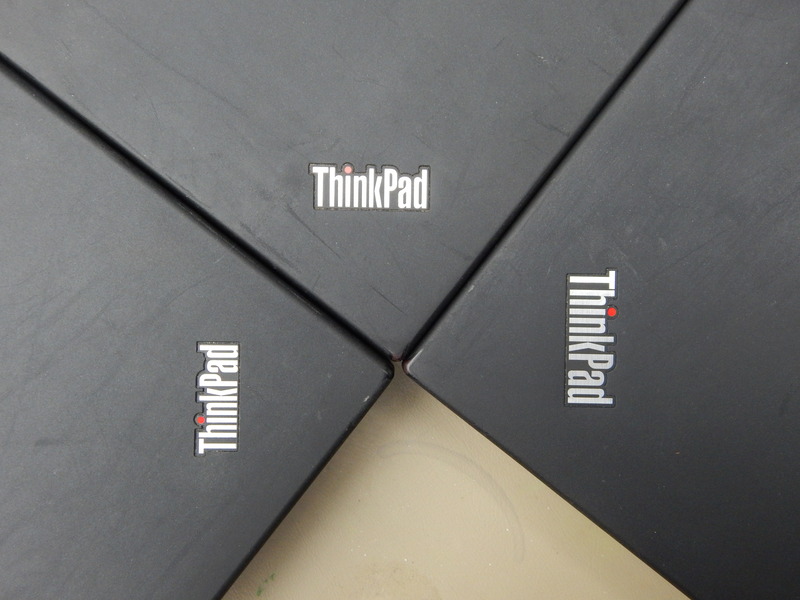 Of course to other people, all Thinkpads are ugly. Last edited by TPFanatic on Sun Apr 29, 2018 8:27 pm, edited 2 times in total. Nice pics and explanation. I was not aware of these subtle differences. So, does it mean that with an open lid, the T430 is a bit shorter? By a very small amount. Last edited by TPFanatic on Fri Jul 06, 2018 4:38 pm, edited 1 time in total. Adding the T410 to the mix. Armed with a nos Sanyo 9 cell the T410 was my school laptop for a very short time, about a month. It's a solid tank in feel and weight. Laptop mag weighed it in at 5.6 pounds with the 9 cell. My T410 weighed in at 5.14 pounds (2.33 kg) with the 9 cell, but at present it does not contain a drive. Of course I used it with a drive in it, gotta get that Windows, and I remember it being quite weighty. As normal T series these laptops are equipped with the full arsenal of ports relevant to date: SD/XC card readers, smartcard options, 4 functioning USB ports, Ethernet, Expresscard 34, and Displayport. But the implementations of Modem, 1394, and eSATA are neither necessarily the same or even present. 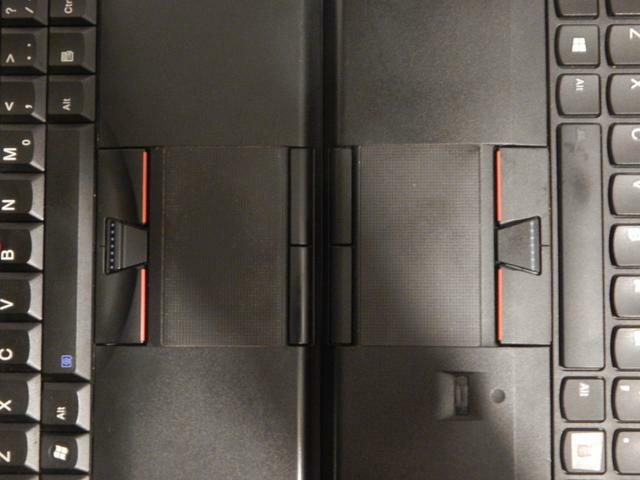 The T410 has the largest variety of ports here with room for 1394 and Modem. The T420, concerning those two ports, can have either 1394 or Modem on a daughter board, but not both, despite all T420 motherboards having, with most not using, the modem connector. The T430 has neither 1394 or Modem. 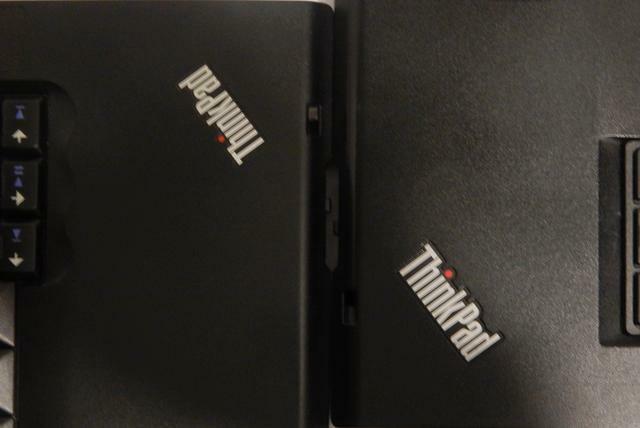 The T410, as well as the Minidock Series 3, have an eSATA data without integrated USB port. To use this data port the drive needs a source of power. For 2.5" drives you can power it with a split eSATA-data and USB-power cable that steals one of the laptop's ports; in the T410's case the powered port is most accessible, but dou'd hope your 2.5" drive has an automatic power off feature because the powered USB port is by default "Always on." The T420's eSATA implementation is the eSATA+USB type. 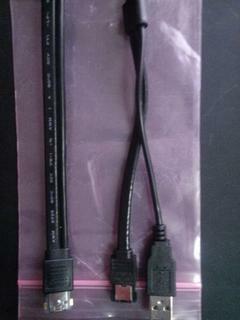 You can plug in the aforementioned cable or get a special eSATA+USB cable. 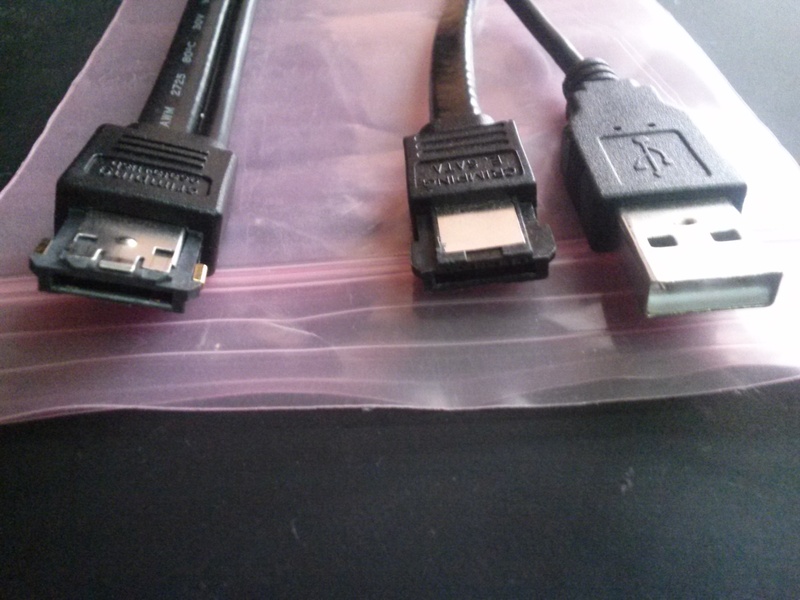 Left: eSATA+USB combo cable. Right: eSATA+USB split cable. 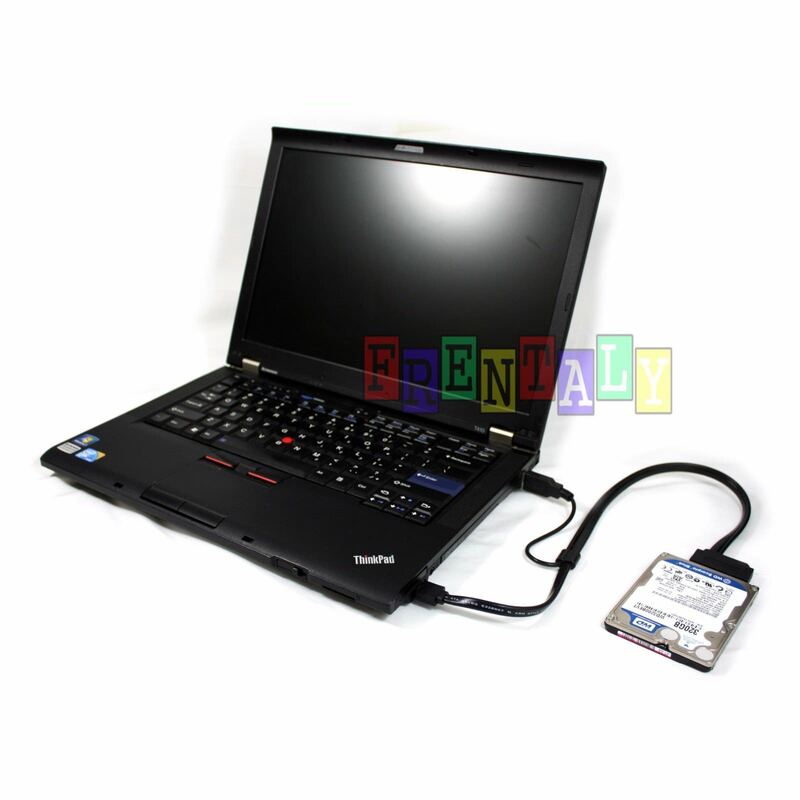 The T430 has no eSATA implementation as the technology is succeeded by USB 3.0. 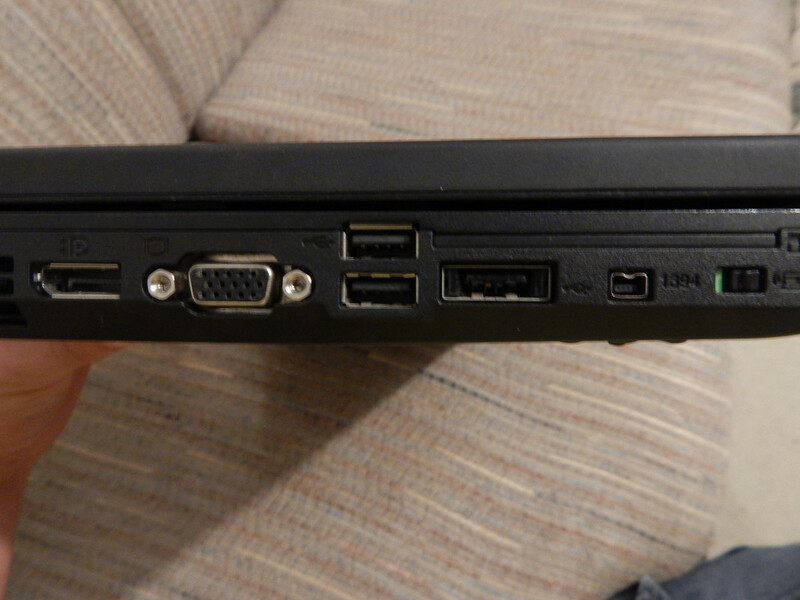 Of note: The T410s has an eSATA+USB combo port, despite being the same generation as the T410. Also of note: Neither of my T520's have any eSATA port, despite obviously having room for it. Perhaps it was an option on the bigger laptop. T410: Vent, VGA, Ethernet, Displayport, 3x USB 2.0, 2.5" 9mm drive bay. T420: Vent, VGA, Ethernet, Displayport, 1x USB 2.0, 2.5" 9mm drive bay. T430: Vent, VGA, Headphone, Mini Displayport, 2x USB 3.0, 2.5" 7mm drive bay. T410: Expresscard 34, Wireless toggle, eSATA data, Headphone, Ultrabay, 1x Powered USB 2.0, 1394, Kensington. T420: Headphone, Ultrabay Enhanced, Wireless toggle, Expresscard 34, SD/XC reader, 1x USB 2.0, eSATA+USB, Kensington. T430: Ultrabay Enhanced, Expresscard 34, SD/XC reader, Wireless toggle, 1x USB 2.0, Kensington. T410: Modem, battery, AC input, vent. T420: Firewire (or Modem), Powered USB, Battery, AC input, vent. T430: Powered USB, Ethernet, battery, AC input, vent. 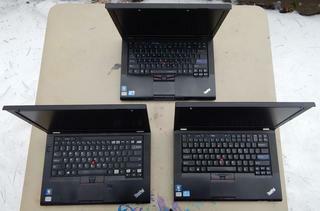 Clockwise from lower left: T410, T420, T430. Last edited by TPFanatic on Fri Jul 06, 2018 4:40 pm, edited 2 times in total. Thank you for continuing and expanding this survey. I would add "T410" to the title of the thread now that it's featured. A bit poor comparison but it shows the T430 is the lightest machine. 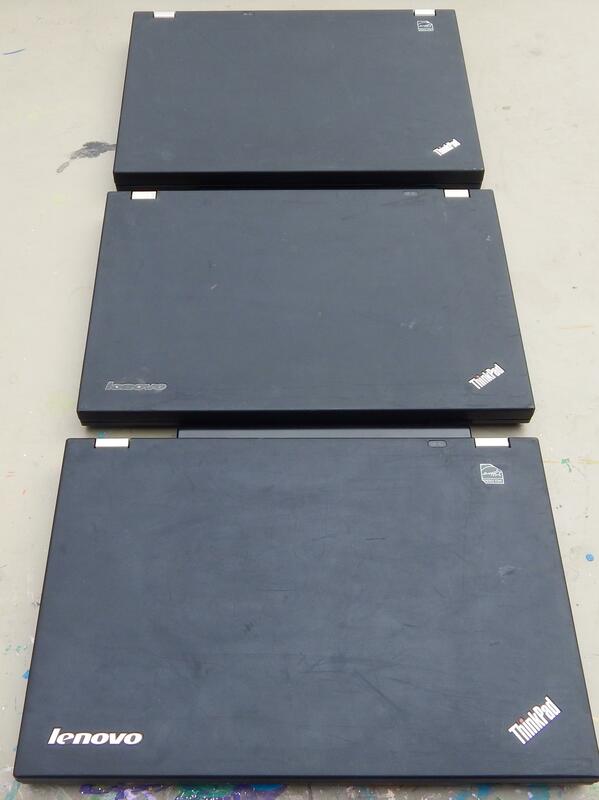 Between T410 and T420 I don't know which is heavier. I measured my T410 (Core i5, Intel GPU, WXGA+ LCD, SSD, 9-cell battery, DVD) at 2.365 kg. With an HDD it will be a bit heavier. Maybe ~50 grams. 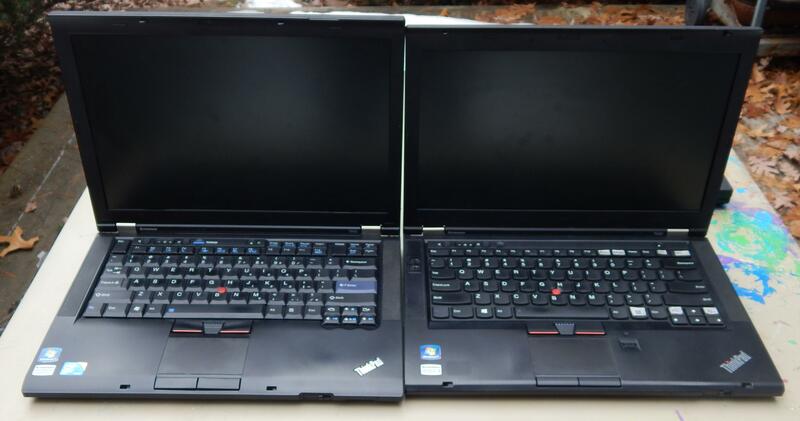 This also means that the actual difference between T420 and T430 is a bit smaller than your measurements show. All three are really very close; I wouldn't consider weight relevant when choosing between them. My T430s (Core i7, Intel GPU, FHD AHVA LCD, SSD, 6-cell battery, DVD) was measured at 1.735 kg, and that's with a standard 2.5" drive bay (again, SSD, add ~50g for HDD). So it seems Lenovo managed to incorporate some weight savings in T420s/T430s and still have a full-size drive bay, which is impressive. 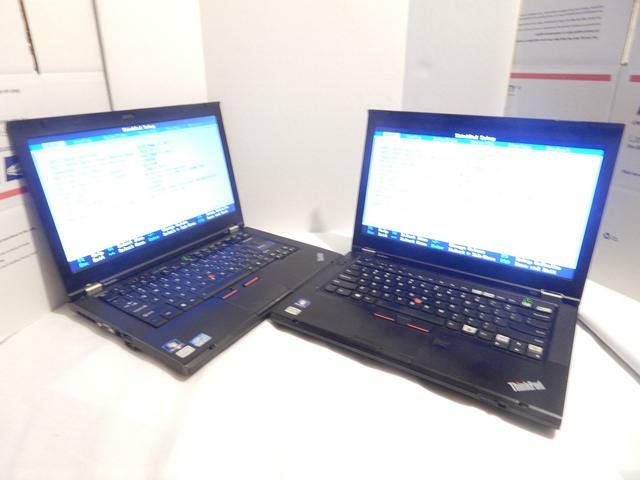 There may also be some weight differences between the LCD panels of the T410s and the AHVA aftermarket LCD on the T430s; LCD panels do generally get lighter with each new generation. Small remark: only Minidock Plus Series 3 (and only the old version, without the USB 3.0) has the eSATA port. 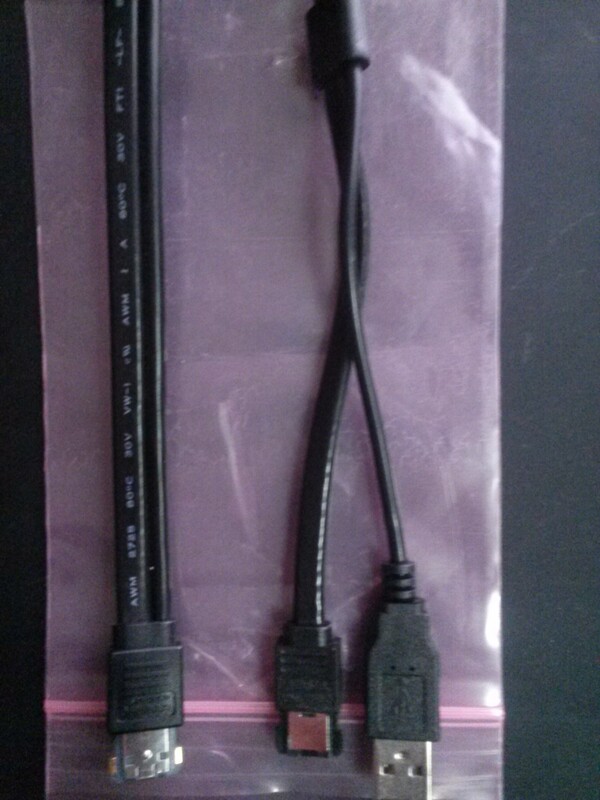 I haven't really used eSATA much, except for testing, but I thought about this, that if I did have a need for eSATA, I would prefer the T420 solution with a combined eSATA+USB port, because of the simpler power delivery without an extra cable. But if you use a 3.5" drive which needs its own power supply anyways, I guess it doesn't matter. 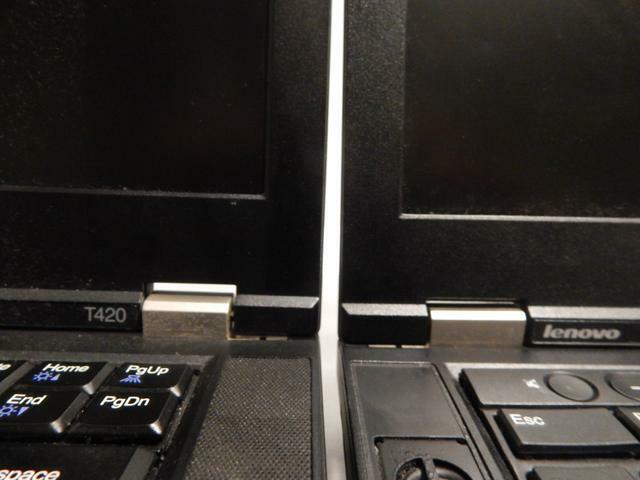 The touchpad buttons are quite a bit bigger on T410 vs 420/430, thanks to the 8:5 form factor. But I don't think it will actually matter to most touchpad users. I need to buy a notebook, and because of my work (I'm a movie and all types of texts translator, and eventually, games). But all I need is to see the movies and the games, but in the case of the movies, I need to download subtitling softwares. I also do audio transcription, so I also need to download transcription softwares. So, I have a little budget, and I was thinking about Lenovo's Thinkpad T430. 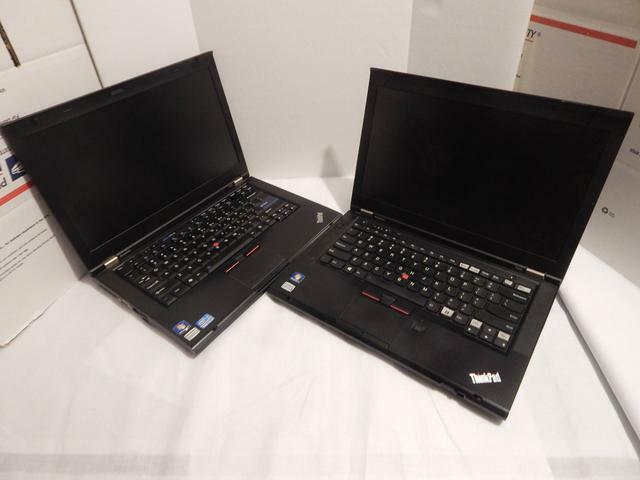 But I also find a 2nd generation (t420) less expensive. The T430 is between 269 and 320 euros, and the 420 I found for 200 euros. I'd to know if there are too many differences between both computers. plus the extra expense of another (T420) keyboard. But if you're happy with the T430 keyboard layout, no problem. The T430 has the better graphics and CPU plus USB3.0, but has a different (less popular) keyboard layout with chicklet keys. Both have only mediocre screens (1366x768 or 1600x900). For the rest they are almost the same. The T420 can have a modded BIOS to remove the wifi-whitelist. The T430 requires an SPI-programmer and more DIY to remove the wifi-whitelist. But if budget is important, then the T420 (with 1600x900) will do you fine for yet a few years. I agree with this - I had a T420 before driving it into the ground for some time in addition to my T430. As much as I don't *mind* the T430 chiclet keyboard - it definitely is not the same as the T420 keyboard. 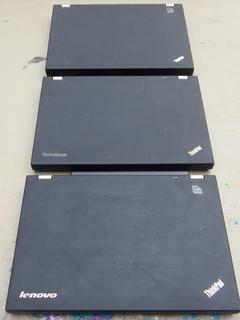 I think a T420 if in good condition and was taken care of by previous owners - will do you just fine for what you need. I agree with the teamde78 and RBS, a T420 is still a very capable laptop and it will be blazing fast with an SSD.